This is the tiniest of travelogues describing a field trip to a branch of the Internet Archive in Fort Wayne (Indiana), July 11, 2001. Here at the Hesburgh Libraries we are in the midst of a digitization effort affectionately called the Catholic Pamphlets Project. We have been scanning away, but at the rate we are going we will not get done until approximately 2100. Consequently we are considering the outsourcing of the scanning work, and the Internet Archive came to mind. In an effort to learn more about their operation, a number of us went to visit a branch of the Internet Archive, located at the Allen County Public Library in Fort Wayne (Indiana), on Monday, July 11, 2011. When we arrived we were pleasantly surprised at the appearance of the newly renovated public library. Open. Clean. Lots of people. Apparently the renovation caused quite a stir. “Why spend money on a public library?” The facilities of the Archive, on the other hand, were modest. It is located in the lower level of the building with no windows, cinderblock walls, and just a tiny bit cramped. We were then given a tour of the facility and learned about the workflow. Books arrive in boxes. Each book is associated with bibliographic metadata usually found in library catalogs. Each is assigned a unique identifier. The book is then scanned in a “Scribe”, a contraption cradling the book in a V-shape while photographing each page. After the books are digitized they are put through a bit of a quality control process making sure there are no missing pages, blurry images, or pictures of thumbs. Once that is complete the book’s images and metadata are electronically sent to the Internet Archive’s “home planet” in San Francisco for post-processing. This is where the various derivatives are made. Finally, the result is indexed and posted to the ‘Net. People are then free to download the materials and do with them just about anything they desire. We have sent a number of our pamphlets to the Fort Wayne facility and you can see the result of the digitization process. From my point of view, working with the Internet Archive sounds like a good idea, especially if one or more of their Scribes comes to live here in the Libraries. All things considered, their services are inexpensive. They have experience. They sincerely seem to have the public good at heart. They sure are more transparent than the Google Books project. Digitization by the Internet Archive may be a bit challenging when it comes to items not in the public domain, but compared to the other issues I do not think this is a very big issue. 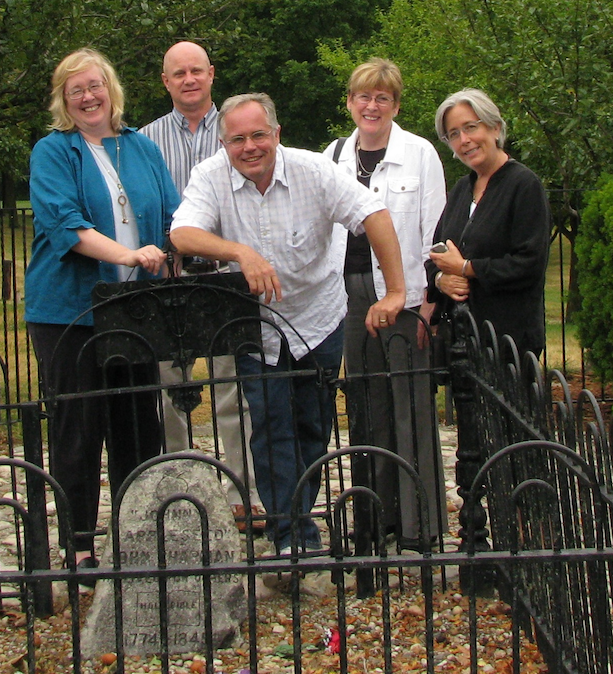 To cap off our visit to Fort Wayne we made a pilgrimage to Johnny Appleseed’s (John Chapman’s) grave. A good time was had by all.